Inflammation is a symptom of heavy metal toxicity and is integral in the development of illnesses such as hypertension, arteriosclerosis, asthma, psoriasis, arthritis, hepatitis, acne, colitis, and many other degenerative diseases. Inflammation can be caused by toxic heavy metals interfering with the equilibrium of omega-3 and omega-6 fatty acids conversion pathways. The specific biological functions of fatty acids depend upon the number and position of double bonds and the length of the acyl chain. Omega-3 fatty acids are a family of unsaturated fatty acids that are important components of cell membranes. Alpha-Linolenic acid (ALA) is the only essential omega-3, meaning that the body cannot produce ALA. It must be obtained from dietary sources such as salmon, soy beans, flax seed oil, walnuts and dark leafy vegetables. ALA is crucial for maintaining cardiovascular health and can reduce the risk of diabetes and cancer through the anti-inflammatory series-3 prostaglandin pathways. ALA is converted to Eicosapentaenoic acid (EPA) though a series of three enzymatic steps, dependent upon Vitamin B6, Magnesium, Zinc, Niacin and Vitamin C. EPA is obtained from fish and fish oils and supports cardiovascular health. EPA can be converted to biochemical intermediates involved in the anti-inflammatory series-3 prostaglandins. Docosapentaenoic acid (DPA) and Decosahexanenoic acid (DHA) can be made from EPA. DHA is also obtained from fish, fish oils, human milk, egg yolks, liver, brain and other organ meats. EPA and DHA are precursors to several classes of eicosanoids (mainly inflammatory) and docosanoids (anti-inflammatory) that have important roles. DHA is the most abundant omega-3 fatty acid in most tissues and is present in large amounts in the brain and retina. DHA is required for infant brain development and function, central nervous system development and optimal visual acuity. Omega-6 fatty acids consist of Linoleic acid (LA) that is found in vegetable oils and grain. LA is an essential fatty acid with cardio-protective benefits. Studies show that LA content in adipose tissue was inversely associated with cardiovascular disease risk; the greater the content of LA, the lower the risk for cardiovascular disease. It is converted to Gamma-linolenic acid (GLA), which is also obtained from borage oil, black currant seed and evening primrose. GLA is converted to dihomo-gamma-linolenic acid (DGLA) which then converts to series-1 prostaglandins and Arachidonic acid (AA) which converts to series-2 prostaglandins and series-4 leukotrienes. These inflammatory agents are usually synthesized in response to an emergency stress signal. EPA-generated series-3 prostaglandins and series-5 leukotrienes modulate the effects of an excessive response of series-2 prostaglandins. It is important to maintain adequate levels of series-3 prostaglandin to protect against inflammation-based illnesses such as arthritis, lupus and asthma. Both EPA and AA are 20-carbon fatty acids that are precursors to the formation of prostaglandins, thromboxanes and leukotrienes. These hormone-like molecules belong to a larger family of substances called eicosanoids. Eicosanoids are localized tissue hormones that seem to be one of the fundamental regulatory classes of molecules in higher life forms. They do not travel in the blood, but locally regulate cellular processes, including Calcium transport, dilation and contraction of muscles, inhibition and promotion of clotting, regulation of secretion of gastric juices and hormones, regulation of fertility, cell division and growth. Omega-6 fatty acids are sometimes viewed as pro-inflammatory mediators; however the ratio of omega- 3 to omega-6 fatty acids appears to be the critical factor in inhibiting the inflammatory response. The impact is dependent on the type and quantity of the omega-6 fatty acids consumed and the ability of the body to convert omega-3 fatty acids to anti-inflammatory mediators which is dependent upon competitive enzymatic activity. Two critical conditions affect omega-3 and 6 fatty acids enzymatic conversion rates. First, omega-3 and omega-6 fatty acids require the same enzymes for conversion into their respective Prostaglandin, Thromboxane and Leukotriene equivalents. Excessive intake of omega-6 relative to omega-3 can competitively inhibit the enzyme activity and prevent the production of anti-inflammatory substances. Second, the activity of the enzymes is also dependent upon nutrient co-factors such as Magnesium and Zinc. Toxic heavy metals, such as Mercury specifically block the absorption and assimilation of these nutrients and thus can negatively affect the enzyme activity. Toxic heavy metals can also shift the equilibrium activity of Delta-6 desaturase to increase the production of GLA, DGLA and AA and decrease the production of EPA, DPA and DHA. This results in an increase of the pro-inflammatory mediators and worsens symptoms in illnesses such as arthritis and asthma. The most effective course of action to reverse and prevent inflammatory symptoms is to detoxify the body from toxic heavy metals such as Mercury, by using Advanced Cellular Zeolite (ACZ) nano. ACZ removes toxins from the body so that it is possible for adequate absorption and assimilation of critical nutrients such as Magnesium and Zinc to occur. Adequate levels of these nutrients provide for proper enzymatic function and therefore a balanced, healthy omega-3 and 6 metabolisms in the body. 2-Bistrian, BR. 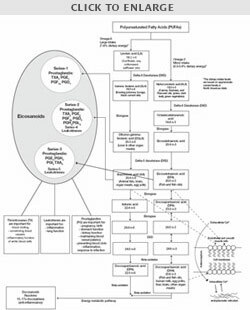 Clinical aspects of essential fatty metabolism. Journal of Parenteral and Enteral Nutrition 2003; 27(3):168-75. 3-do Nascimento, CM, Oyama, LM. Long chain polyunsaturated fatty acids essential for brain growth and development. Nutrition 2003; 19(1):66-67. 4-Carlson, SE, Neuringer, M. Polyunsaturated fatty acid status and neurodevelopment: A summary and critical analysis of the literature. Lipids 1999; 34(2):171-8. 5-Gil, A, Ramirez, M, Gil,M. Role of long-chain polyunsaturated fatty acids in infant nutrition. European Journal of Clinical Nutrition 2003; 57(Suppl 1):31-34. 6-Faooqui,AA, Horrocks,LA, Faooqui,T. Glycerolphospholipids in the brain: Their metabolism, incorporation into membranes, functions and involvement in neurological disorders. Chemistry and Physics of Lipids 2000; 106(1):1-29. 7-MacLean, CH, Issa, AM, Newberry, SJ, et al.Effects of Omega -3 Fatty Acids on Cognitive Function with Aging, Dementia and Neurological Diseases. Evidence Report/Technology Assessment No.114. Agency for Healthcare Research and Quality. 2005. 8- Thompson JD, Nechay BR. Inhibition by metals of a canine renal calcium, magnesium-activated adenosinetriphosphatase. J Toxicol Environ Health. 1981 Jun;7(6):901-8. PubMed PMID: 6115068. 9- Araujo GM, Silva CB, Hasson-Voloch A. Comparison of the inhibitory effects of mercury and cadmium on the creatine kinase from Electrophorus electricus (L). Int J Biochem Cell Biol. 1996 Apr;28(4):491-7. PubMed PMID: 9026360. 10- Chetty CS, McBride V, Sands S, Rajanna B. Effects in vitro of mercury on rat brain Mg(++)-ATPase. Arch Int Physiol Biochim. 1990 Oct;98(5):261-7. PubMed PMID: 1708994. 11- Milosević M, Petrović S, Demajo M, Horvat A. Effects of metal ions on plasma membrane Mg2+-atpase in rat uterus and ovaries. Ann N Y Acad Sci. 2005 Jun;1048:445-8. PubMed PMID: 16154973.